The beauty of wildlife animals is amazing…. Not only visually, but the very fact that animals still live FREE is exhilarating. When I heard there are hundreds of wild deer and other wildlife animals in a huge nature reserve close to our home, my response was like that form a little child. Really? Wild deer? Like ‘wild’? Being a real city boy, I was thrilled to the depth of my toes… I always longed to live near wildlife animals! Well, wild… one can question how ‘wild’ wildlife is that lives in a nature reserve, but at least they are left alone in an area of many thousands of acres. A small portion of this wilderness is open to the public, so one day I jumped into my car and drove to this reserve, called ‘Oostvaardersplassen‘. It is quite amazing how this wildlife reserve came about, since it originally was destined to be a huge industrial area. The Dutch had drained a large part of the sea (can you believe it? ), to create more land for themselves. Incredible! A vast area was set apart to become a horrible hell of industry and pollution, ruining the landscapes and the environment. But… nature decided otherwise. Water kept coming up from the ground and the engineers weren’t able to keep the soil dry, so they abandoned it for a few years. Here you see a wildlife phot I made of a stunning wife heron taking off to flight. Click here to see more wild bird photography. Suddenly they noticed how abundant life began to flourish and thousands of birds began to settle in the area. 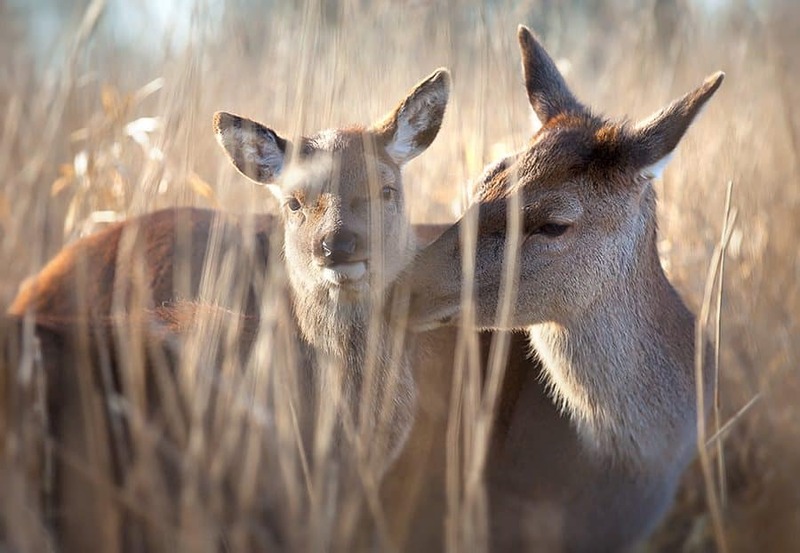 Soon even wildlife animals began to find their way into this new world, and the government made one of their wisest decisions in a long time: they decided to change the destiny for the area and established it to be a new nature reserve. Now hundreds of wild deer, horses and oxen roam there, along with eagles, foxes, snakes, and countless other wonderful creatures. This brand new nature reserve is also host to a herd of almost a thousand wild Konik horses. They are one of the most ancient horse breeds on earth! And the amazing thing is… you can walk in their midst! I was able to take this stunning wildlife photograph of fighting stallions. Click here to see more beautiful wildlife photographs. One day I was strolling through the accessible part of the reserve, and saw some deer in the bush, not far from the trail. Slowly and silently I crouched closer, with my lens ready. I use a Canon 70-200 f/2.8 lens and had it ready to fire. Suddenly the calf noticed me and ran to it’s mother. I crawled a little closer, sweating intensively in the burning summer sun, and when I looked up from the tall grass, I saw this tender moment, where the calf found comfort with it’s caring mother. It was so beautiful, so heart touching… I lifted my camera and took as many photographs as I could. 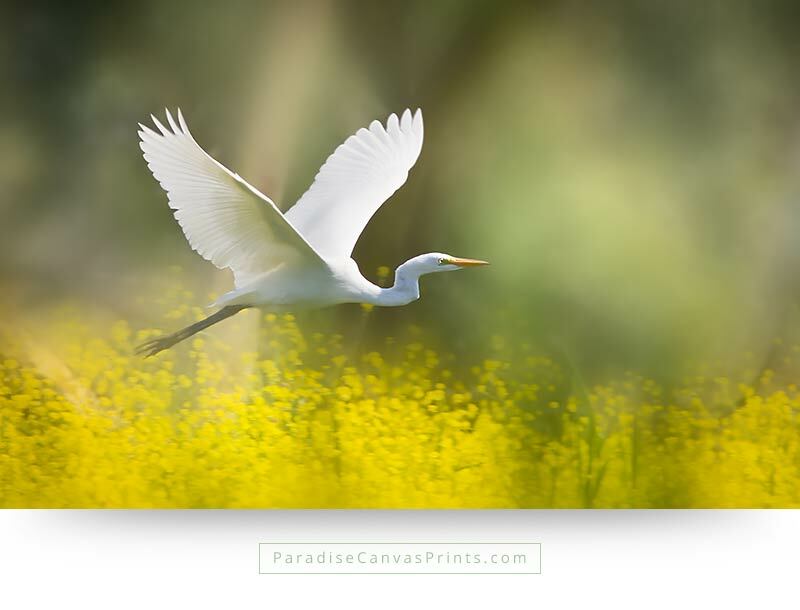 For me this will probably remain one of my all time favorite wildlife canvas prints. 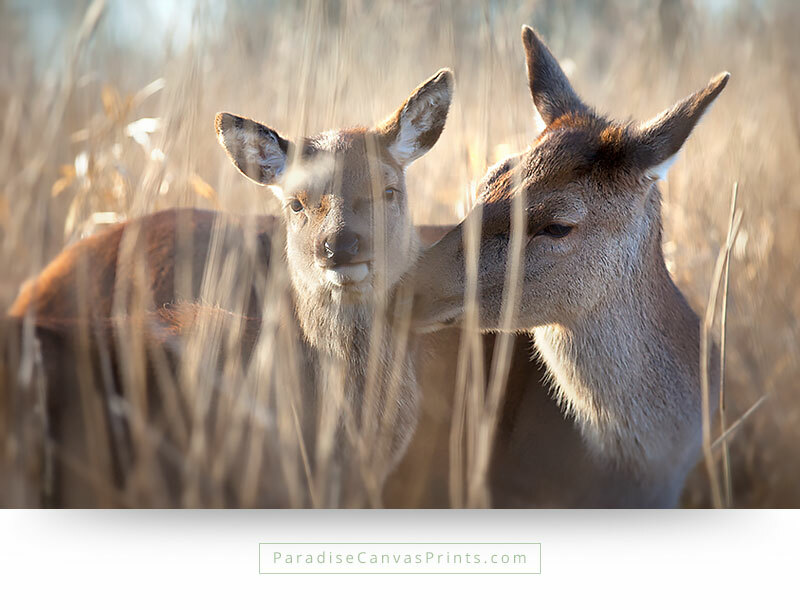 My wife said: ‘This kind of tenderness between wildlife animals is normally only seen in Disney movies!’ To make it possible for others to enjoy this wonderful beauty, I set up a unique wildlife canvas prints collection. So you can now bring this expression of paradise into your home and enjoy it every single day! 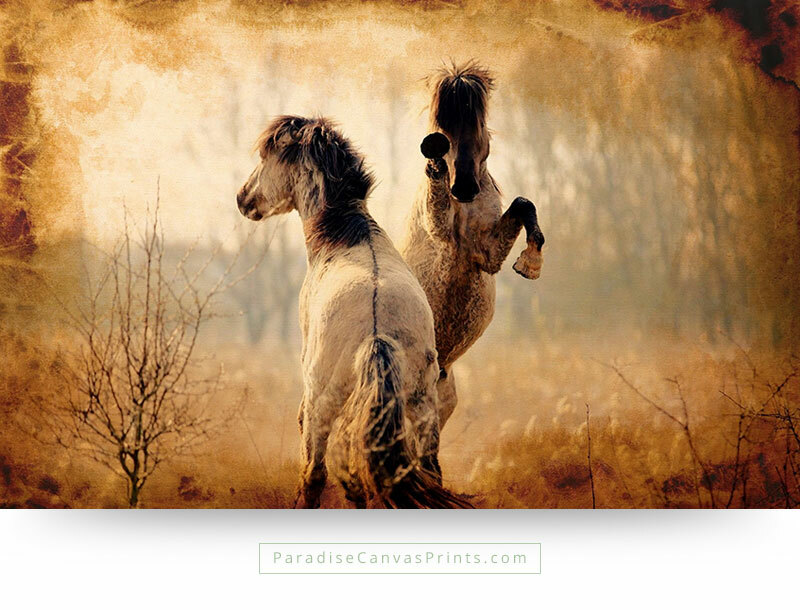 with this unique wildlife canvas print. 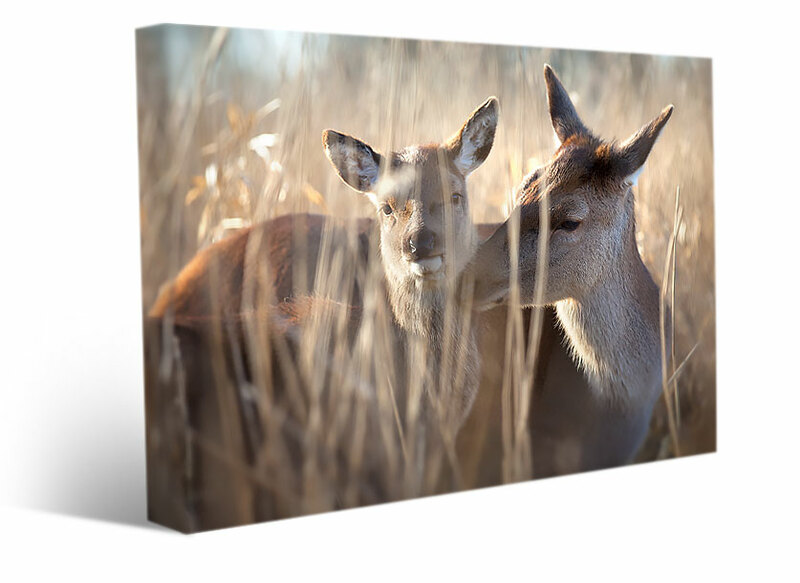 Order This Wildlife Canvas Print!